Cordyceps Sinensis is a unique fungus that grows on caterpillar, and is found in high-altitude areas of the Himalayas. It’s expensive in view of its high demand and limited availability. The Product is 100% Natural and Organic. 1. It Boosts Sexual Health. It is known as the “Himalayan Viagra because it enhances Erectile Functions, Virility, as well as Stamina. 2. It’s good for Women in their Menopausal as well as Post-Menopausal stages, because it enhances the production of estrogen. 3. It Boost Exercise Performance. This Unique Product increases the Ability of the Cells to Utilize Oxygen, as well as Cellular ATP Levels, and thus Enhances Exercise Performance. Record-Breaking Performance of Chinese Athletes is Credited to this Product. 4. It contains Anti-Aging Properties, and so Promotes Longevity. Cordyceps, which are Powerful Antioxidants, Destroy Free Radicals, and Other Toxins in the Body, Which Can Cause Premature Aging, and Degenerative Diseases. 5. It Has Potential Anti-Tumor Effects, and Fights Inflammation. 6. It Helps Manage Type 2 Diabetes. 7. It Benefits Heart Health. 8. It Detoxifies the body. 9. It Boosts the Immune system. 11. It’s Usually Combined to Other Products for Treatment of Ailments. 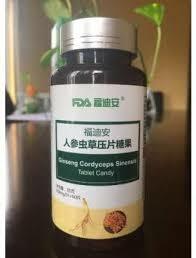 Ginseng Cordyceps Sinensis Candy Tablet is Produced by US FDA and Marketed by Norland Industrial Group, a large scale Multinational Industrial Group, founded in 2008, and involved in health, medical cosmetology, direct selling, e-commerce Industry, etc. The Product Contains 60 Tablets In a Bottle. Dosage: Chew 1 – 2 Tablets Daily, 1 hour before meal, and wash down with water; please no cold water. and other Products, please text or call me on +2348034863154 or +2348097890448 (this is also my WhatsApp no.) or send a mail to lynmail45@gmail.com, and I will promptly attend to you. Ginseng Cordyceps Sinensis Candy Tablet 100% Natural and Organic Health Product Boosts Sexual Health Athletes Performance Immunity Etc.